Review Summary: A complete waste of two legends. Teen Patti is best avoided. Genius math professor Venkat Subramaniam (Amitabh Bachchan) is obsessed with a breakthrough theory that could redefine the principles of probability. Teen Patti is about a genius professor of mathematics who makes a life-altering discovery about the theory of probability and randomness. I don't know much about math but I can safely say that in all probability you will not enjoy this film. 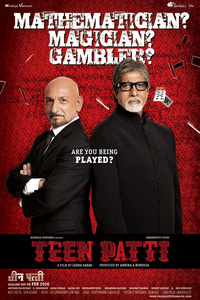 'Teen Patti' is a huge corporate blunder but what is more disturbing is to see two stalwarts of acting Big B and Sir Ben Kinsley coming together on screen and absolutely doing nothing for the viewers and more depressing is to see Sir Ben Kinsley doing a mere listening act. Teen Patti is a card game, which can have seasoned gamblers salivating at the mouth. Even casual players who may just indulge in a couple of rounds at Diwali or New Year love the excitement.